Today’s guest post is written by one of our teacher advocates, Sebastian Byers, about his experience at ISTE. Sebastian is a science teacher at Union County Virtual in North Carolina. He is a North Carolina PBS Digital Innovator 2017 and Digital Innovator All-Star 2018-2020, a panelist for PBS Climate Conversations webinar series, featured in this PBS blog, Master Teacher Trainer for Public Media North Carolina, Digital Ambassador for NC Department of Public Instruction, and Kappa Delta Pi educational honors society member. He is also a Fellow for the North Carolina Science Leadership Association. I had a wonderful time at the 2018 International Society for Technology in Education (ISTE) Conference & Expo in Chicago. I had flown into Chicago before on the way to a trip out west but had never spent any significant time in Chi-town before. Chicago reminds me of most Great Lake cities but on a much grander scale. Even during the summer, it was not hard to envision the howling wind coming off the Great Lakes that were such an impressionable part of my childhood. ISTE can be a bit overwhelming so I zeroed in on small manageable experiences that I believed I could use in my classroom. Don’t get me wrong there are amazing things that defy description at this conference, but for a humble science teacher from the suburbs of Charlotte, North Carolina I felt a bit like Fievel in the big city. So, I was more than happy to answer the call from Listenwise when they reached out to me to help with the booth at ISTE. Last year my conversation with the representatives from Listenwise on the floor was one of the highlights of my conference as I came away with the impression, nice folks, great product that I can use right away in my classroom. Fast forward one year, I found myself working the Listenwise booth as part of the inaugural Listenwise Advocate program. I got to meet a good number of people, teachers, technology coordinators, and product developers who were all very impressed with the Listenwise product. One of the most salient points from most conversations was that educators are looking for real-world examples for their content. As KQED examines in Mindshift Applying the Power of Stories to Excite Students About Science about a couple who have developed several unique science camps in Chicago, “students remember experiences, they retain what they learn through experience much better than what they retain through lecture and note taking”. Whether math, science, social studies, or ELL teachers are looking for good stories that their students can relate to. Several features of the Listenwise product satisfies a growing demand for educational resources. As a high school science teacher, I work tirelessly to take rote science knowledge and wrap it into a good story, based in the real world and that leads to a unique learning experience. Students in our classrooms are wired into their world more than ever before. Through social media, students can explore a vast array of information right at their fingertips. The challenge as a teacher is to convince these students that their devices are tools that can do more than view videos from their favorite blogger. Another unique predicament we face in the social-media age classroom is persistence of word of mouth exchanges of information. Many of our students are exposed daily to hearsay, misbeliefs or strongly worded opinions that they take as fact. As a science teacher, I work diligently to show my students examples of bad science practices, bunk studies, and poorly drawn conclusions. To grow my student’s science skills, I look for sources of information that are interesting to the student, grounded in reliable sources, and promote the positive use of technology. After talking with other teachers on the floor at ISTE I know I am not alone in these needs. Listenwise provides a platform that hits all these buttons. The stories curated into Listenwise lessons are from trusted sources like NPR, the titles are catchy and interesting to the students. A further plus is that Listenwise allows me to use student devices for a positive purpose in the classroom. I know a lot of teachers who have a ‘no cell phone’ policy, including one teacher who puts phones into a safe at the beginning of class. Instead of separating students from their devices, why not let them use the device to gather a broader perspective on the world around them? Why not ask them to create content and stories using listening skills? Listenwise has been well received by all my students, even the hard to reach students that are a feature of every classroom. After listening to the story, my students often wish to share with me and classmates their experiences, opinions, and questions about the subject of the Listenwise story. I use this enthusiasm to challenge my students to become storytellers, interviewers, and commentators themselves. 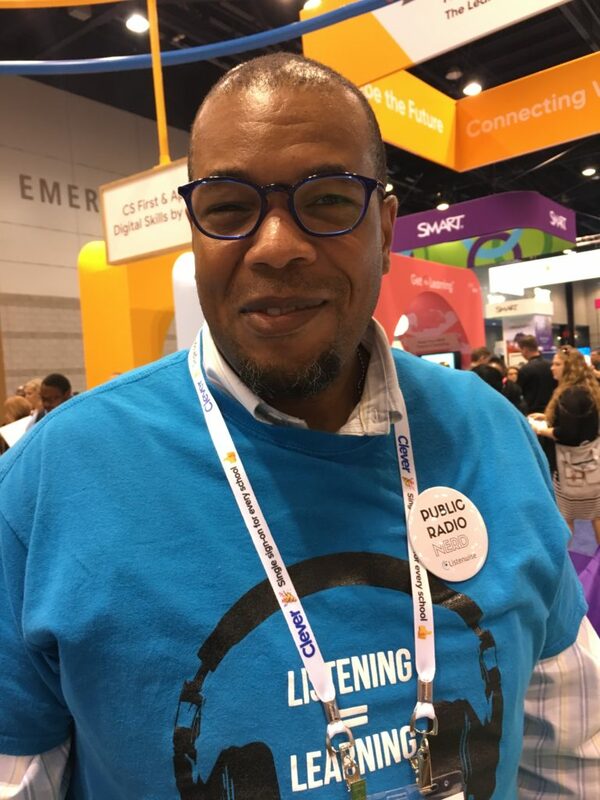 Many of the persons I spoke with on the floor at ISTE loved to tell me and the other volunteers how much they love public radio. I do too and the brilliance of Listenwise is that allows me as a classroom teacher to share this joy with my students in a well-designed and supportive product. The power of listening is transformative, and I am happy to help my students become science investigators, examiners of social policies, and questioners of their place in school, community and society. I look forward to heading back to school this Fall and bringing more Listenwise stories into my classroom. ← The Favorite Stories of the Year – From Students!